Research interest is in the area of protein delivery and immunotherapy. 1. Development of lipidic nano particle containing therapeutic proteins and is supported by NHLBI/NIH. The overall goal of the project is to improve therapeutic efficacy of protein based therapies for bleeding and lysosomal disorders using a multidisciplinary approach involving Biophysics/Bioengineering, immunology and pharmacokinetics/Pharmacodynamics. 2. Re-activating Memory T Cells in the Microenvironment of Human Tumors and development of in situ vaccination. This project is supported by NCI/NIH (Dr. Bankert, PI, Balu-Iyer Co-PI). Our aim is to to rationally develop therapeutic intervention by understanding the molecular mechanism of TCR arrest. 3. Develop novel strategies to treat food allergies and autoimmune conditions using the tolerogenic properties of biomolecules. Protein delivery and immunotherapy: Adopts an interdisciplinary approach of biophysics/bioengineering, pharmacokinetic and pharmacodynamic and immunology. Protein formulation: Physicochemical and analytical methods of assessing protein structure, function, and stability in developing improved dosage forms. Gaitonde P; Ramakrishnan R; Chin J; Kelleher R; Bankert R; Balu-Iyer SV. Exposure to Factor VIII in the presence of Phosphatidylserine induces hyporesponsiveness to Factor VIII challenge in Hemophilia A mice. Journal of Biological Chemistry. 2013; 288. K. A. Shetty, E. P. Merricks, R. Raymer, N. Rigsbee, T.C. Nichols and Balu-Iyer SV. Soy phosphatidylinositol containing lipid nanoparticle prolongs the plasma survival and hemostatic efficacy of B-domain deleted recombinant canine Factor VIII in Hemophilia A dogs. J Pharm Sci. 2016; 105(10). Schneider JL, Balu-Iyer SV. Phosphatidylserine Converts Immunogenic Recombinant Human Acid Alpha-Glucosidase to a Tolerogenic Form in a Mouse Model of Pompe Disease. J Pharm Sci. 2016; 105(10). Ramakrishnan R, Balu-Iyer SV. Effect of Biophysical Properties of Phosphatidylserine Particle on Immune Tolerance Induction Toward Factor VIII in a Hemophilia A Mouse Model. J Pharm Sci. 2016; 105(10). Shetty KA, Kosloski MP, Mager DE, Balu-Iyer SV. Factor VIII associated with lipidic nanoparticles retains efficacy in the presence of anti-factor VIII antibodies in hemophilia A mice. Biopharm Drug Dispos. 2016; 37(7). Ramakrishnan R, Davidowitz A, Balu-Iyer SV. Exposure of FVIII in the Presence of Phosphatidyl Serine Reduces Generation of Memory B-Cells and Induces Regulatory T-Cell-Mediated Hyporesponsiveness in Hemophilia A Mice. J Pharm Sci. 2015; 104(8). Fathallah AM, Turner MR, Mager DE, Balu-Iyer SV. Effects of hypertonic buffer composition on lymph node uptake and bioavailability of rituximab, after subcutaneous administration. Biopharm Drug Dispos. 2015; 36(2). Fathallah AM, Balu-Iyer SV. Anatomical, physiological, and experimental factors affecting the bioavailability of sc-administered large biotherapeutics. J Pharm Sci. 2015; 104(2). Shetty KA, Kosloski MP, Mager DE, Balu-Iyer SV. Soy phosphatidylinositol containing nanoparticle prolongs hemostatic activity of B-domain deleted factor VIII in hemophilia A mice. J Pharm Sci. 2015; 104(2). Fathallah AM, Ramakrishnan R, Balu-Iyer SV. O-phospho-l-serine mediates hyporesponsiveness toward FVIII in hemophilia A-murine model by inducing tolerogenic properties in dendritic cells. J Pharm Sci. 2014; 103(11). Gaitonde P, Purohit VS, Balu-Iyer SV. Intravenous administration of Factor VIII-O-Phospho-L-Serine (OPLS) complex reduces immunogenicity and preserves pharmacokinetics of the therapeutic protein. Eur J Pharm Sci. 2014; 66C. Kosloski MP, Shetty KA, Wakabayashi H, Fay PJ, Balu-Iyer SV. Effects of replacement of factor VIII amino acids Asp519 and Glu665 with Val on plasma survival and efficacy in vivo. AAPS J. 2014; 16(5). Kosloski M; Pisal D; Mager DE; Balu-Iyer SV. Allometry of Factor VIII and informed scaling of next generation therapeutic proteins. Journal of Pharmaceutical Sciences. 2013. Trummer BJ; Iyer VS; Balu-Iyer SV; O'Connor R; Straubinger RM. Physicochemical properties of EGF receptor inhibitors and development of a nanoliposomal formulation of gefitinib. Journal of Pharmaceutical Sciences. 2012; 101. Trummer BJ, Iyer V, Balu-Iyer SV, O‘Connor R, Straubinger RM. Physicochemical properties of epidermal growth factor receptor inhibitors and development of a nanoliposomal formulation of gefitinib. J Pharm Sci. 2012; 101(8). Gaitonde P; Straubinger RM; Bankert R; Balu-Iyer SV. Down-regulation of CD40 signal and induction of TGF- beta by Phosphatidylinositol, mediates reduction in immunogenicity against recombinant human Factor VIII. Journal of Pharmaceutical Sciences. 2012; 101. Bhansali SG; Balu-Iyer SV; Morris ME. Influence of route of administration and liposomal encapsulation on blood and lymph node exposure to the protein VEGF-C156S. J Pharm Sci. 2012; 10. Peng A; Ding H; Kosloski M; Balu-Iyer SV. PEGylation of FVIII-PI Complex: Pharmacokinetics and Immunogenicity in Hemophilia A Murine Model. AAPS Journal. 2012; 14. Peng A; Doty A; Pisal D; Balu-Iyer SV. Phosphatidylinositol induces fluid phase formation and packing defects in phosphatidylcholine model membranes. Chemistry and Physics of Lipids. 2012; 165. Kagan L; Turner M; Balu-Iyer SV; Mager DE. Subcutaneous absorption of monoclonal antibodies: role of dose, site of injection, and injection volume on rituximab pharmacokinetics in rats. Pharm Res. 2012; 29. Kosloski M; Peng A; Varma P; Miclea RD; Mager DE; Balu-Iyer SV. Immunogenicity and pharmacokinetic studies of recombinant Factor VIII containing lipid cochleates. Drug Delivery. 2011; 8 (20. Gaitonde P; Balu-Iyer SV. In vitro Immunogenicity Risk-assessment of Therapeutic Proteins in Preclinical Setting. Methods in Molecular Biology. 2011; 716 (. Peng A; Straubinger RM; Balu-Iyer SV. Phosphatidylinositol containing lipidic particle reduces inhibitor development and catabolism of factor VIII in hemophilia A mice. AAPS Journal. 2011; 12 (2. Pisal D; Balu-Iyer SV. Phospholipid binding improves plasma survival of Factor VIII. Thrombosis and Haemostasis. 2011; 104 (. Pisal DS; Balu-Iyer SV. Phospholipid Binding Lowers Immunogenicity of Human Recombinant Factor VIII in von Willebrand Factor Knockout Mice. Thrombosis and Haemostasis. 2011; 105. Gaitonde P, Balu-Iyer SV. In vitro immunogenicity risk assessment of therapeutic proteins in preclinical setting. Methods Mol Biol. 2011; 716. Peng A, Straubinger RM, Balu-Iyer SV. Phosphatidylinositol containing lipidic particles reduces immunogenicity and catabolism of factor VIII in hemophilia a mice. AAPS J. 2010; 12(3). Pisal DS, Kosloski MP, Balu-Iyer SV. Delivery of therapeutic proteins. J Pharm Sci. 2010; 99(6). Themistou E; Singh I; Shang C; Balu-Iyer SV; Alexandridis P; Neelamegham S. Application of fluorescence spectroscopy to quantify shear-induced protein conformation change. Biophysical Journal. 2010; 97. Balu-Iyer SV; Pisal DS; Kosloski M. Delivery of Therapeutic Proteins Journal of Pharmaceutical Sciences. 2010; 99 20. Peng A; Gaitonde P; Kosloski MP; Miclea RD; Varma P; Balu-Iyer SV. Effect of route of administration of human recombinant Factor VIII on its immunogenicity in Hemophilia A mice Journal of Pharmaceutical Sciences. 2010; 98 20. Kosloski M; Miclea RD; Balu-Iyer SV. Role of Glycosylation in Conformational stability, activity, macromolecular interaction and immunogenicity of recombinant human Factor VIII AAPS Journal. 2010; 11 20. Rao G; Iyer V; Kosloski MP; Pisal DS; Midduagh CR; Balu-Iyer SV. Use of a folding model and in situ biophysical techniques rational formulation development and stability testing of monoclonal antibody therapeutics Journal of Pharmaceutical Sciences. 2010; 99 20. Rao G, Iyer V, Kosloski MP, Pisal DS, Shin E, Middaugh CR, Balu-Iyer SV. Use of a folding model and in situ spectroscopic techniques for rational formulation development and stability testing of monoclonal antibody therapeutics. J Pharm Sci. 2010; 99(4). Peng A, Gaitonde P, Kosloski MP, Miclea RD, Varma P, Balu-Iyer SV. Effect of route of administration of human recombinant factor VIII on its immunogenicity in Hemophilia A mice. J Pharm Sci. 2009; 98(12). Themistou E, Singh I, Shang C, Balu-Iyer SV, Alexandridis P, Neelamegham S. Application of fluorescence spectroscopy to quantify shear-induced protein conformation change. Biophys J. 2009; 97(9). Kosloski MP, Miclea RD, Balu-Iyer SV. Role of glycosylation in conformational stability, activity, macromolecular interaction and immunogenicity of recombinant human factor VIII. AAPS J. 2009; 11(3). Korotchkina LG; Ramani K; Balu-Iyer SV. Folding consideration of therapeutic proteins. Prog Mol Biol Transi Sci. 2008; 83. Ramani K; Miclea RD; Gaitonde P; Straubinger RM; Balu-Iyer SV. Passive Transfer of Polyethyleneglycol to Liposomal-Recombinant Human FVIII Enhances its Efficacy in a Murine Model for Hemophilia A. Journal of Pharmaceutical Sciences. 2008; 97. Themistou E; Singh I; Balu-Iyer SV; Alexandridis P; Neelamegham S. Change in Solution Structure of Human Blood Protein von Willebrand Factor Caused by Shear. Polym. Prepr. (Am. Chem. Soc., Div. Polym. Chem.). 2008; 49. Ramani K; Miclea RD; Purohit VS; Straubinger RM; Mager DE; Balu-Iyer SV. Phosphatidylserine Containing Liposomes reduce Immunogenicity of Recombinant Human Factor VIII in a Murine Model of Hemophilia A. Journal. Pharmaceutical Sciences. 2008; 97. Korotchkina LG, Ramani K, Balu-Iyer SV. Folding considerations for therapeutic protein formulations. Prog Mol Biol Transl Sci. 2008; 83. Miclea RD, Varma PR, Peng A, Balu-Iyer SV. Development and characterization of lipidic cochleate containing recombinant factor VIII. Biochim Biophys Acta. 2007; 1768(11). Miclea RD; Varma PR; Peng A; Balu-Iyer SV. Development and characterization of lipidic cochleate containing recombinant factor VIII. Biochimica Biophysica Acta. 2007; 1768. Miclea RD, Purohit VS, Balu-Iyer SV. O-phospho-L-serine, multi-functional excipient for B domain deleted recombinant factor VIII. AAPS J. 2007; 9(2). Miclea RD; Purohit VS; Balu-Iyer SV. O-Phospho-L-Serine, Multi-functional Excipient for B Domain Deleted Recombinant Factor VIII. AAPS. 2007; 9. Purohit VS, Balasubramanian SV, Balu-Iyer SV. Interaction of dicaproyl phosphatidylserine with recombinant factor VIII and its impact on immunogenicity. AAPS J. 2006; 8(2). Purohit VS, Middaugh CR, Balasubramanian SV, Balu-Iyer SV. Influence of aggregation on immunogenicity of recombinant human Factor VIII in hemophilia A mice. J Pharm Sci. 2006; 95(2). Purohit VS, Balasubramanian SV, Balu-Iyer SV. Interaction of dicaproyl phosphatidylserine with recombinant factor VIII andits impact on immunogenicity. AAPS J. 2006; 8(2). Ramani K, Purohit V, Middaugh CR, Balasubramanian SV, Balu-Iyer SV. Aggregation kinetics of recombinant human FVIII (rFVIII). J Pharm Sci. 2005; 94(9). Ramani K, Purohit VS, Miclea RD, Middaugh CR, Balasubramanian SV, Balu-Iyer SV. Lipid binding region (2303-2332) is involved in aggregation of recombinant human FVIII (rFVIII). J Pharm Sci. 2005; 94(6). Purohit VS, Ramani K, Sarkar R, Kazazian HH, Balasubramanian SV, Balu-Iyer SV. Lower inhibitor development in hemophilia A mice following administration of recombinant factor VIII-O-phospho-L-serine complex. J Biol Chem. 2005; 280(18). Campbell RB, Balasubramanian SV, Straubinger RM, Balu-Iyer SV. Influence of cationic lipids on the stability and membrane properties of paclitaxel-containing liposomes. J Pharm Sci. 2001; 90(8). Campbell RB, Balasubramanian SV, Straubinger RM, Balu-Iyer SV. Phospholipid-cationic lipid interactions: influences on membrane and vesicle properties. Biochim Biophys Acta. 2001; 1512(1). Situ H, Balasubramanian SV, Bobek LA. Role of alpha-helical conformation of histatin-5 in candidacidal activity examined by proline variants.. Biochim Biophys Acta. 2000; 1475(3). Zhou R, Balasubramanian SV, Kahl SB, Straubinger RM. Biopharmaceutics of boronated radiosensitizers: liposomal formulation of MnBOPP (manganese chelate of 2,4-(alpha, beta-dihydroxyethyl) deuterioporphyrin IX) and comparative toxicity in mice. J Pharm Sci. 1999; 88(9). Shao K, Balasubramanian SV, Bahl OP, Balu-Iyer SV. Role of amino acid residues at the interface of alpha52asparginyl-N-glycosyl chain of human choriogonadotropin. Mol Cell Endocrinol. 1999; 150(1-2). Shao K, Balasubramanian SV, Pope CM, Bahl OP, Balu-Iyer SV. Effect of individual N-glycosyl chains in the beta-subunit on the conformation of human choriogonadotropin. Mol Cell Endocrinol. 1998; 146(1-2). Purohit S, Shao K, Balasubramanian SV, Bahl OP, Balu-Iyer SV. Mutants of human choriogonadotropin lacking N-glycosyl chains in the alpha-subunit. 1. Mechanism for the differential action of the N-linked carbohydrates. Biochemistry. 1997; 36(40). Balasubramanian SV, Alderfer JL, Straubinger RM. Solvent- and concentration-dependent molecular interactions of taxol (Paclitaxel). J Pharm Sci. 1994; 83(10). 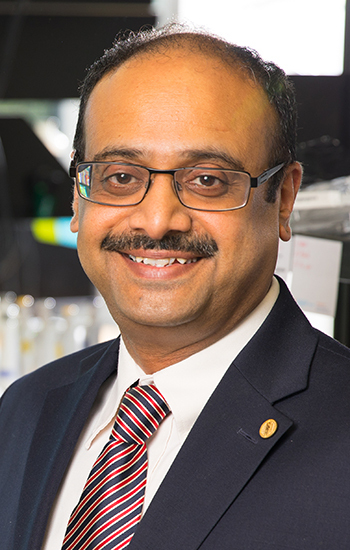 Balasubramanian SV, Straubinger RM. Taxol-lipid interactions: taxol-dependent effects on the physical properties of model membranes. Biochemistry. 1994; 33(30).